Today’s Topic: Mindfulness – What does mindfulness mean to you and how can it help as we live with our autoimmune condition? When I consider people whom I consider to be “mindful,” I find that I admire most of them and get totally annoyed by a few. I think it has to do with confusing the definition of mindfulness with stereotypes, pretense, and gobbledegook. It may have to do with having come of age in the ‘60’s and ‘70’s when many things we now associate with mindfulness were linked with “those hippie people.” It may have to do with a few individuals in my life who have seemingly morphed from mindfulness into total self-absorption. Opposed to them are some women whom I consider the epitome of mindfulness and their inner peace manifests through their kindness to other people. I don’t know whether other people would describe me as mindful and I probably come across more as a down-to-earth Midwestern Grandma who used to be an accountant. At the same time I benefit greatly from the mental aspects of my twice-weekly yoga and have a history of using meditation techniques to deal with anxiety and occasionally pain. So maybe I am more mindful than I think. Before I go too far, I should start with a definition and I’ll use one from the online Greater Good Magazine of the University of California Berkeley. “Mindfulness means maintaining a moment-by-moment awareness of our thoughts, feelings, bodily sensations, and surrounding environment, through a gentle, nurturing lens. I tend to use meditation and mindfulness as synonyms and that is not correct. IMO you can be mindful by living with awareness and acceptance of your life and you don’t have to sit cross-legged and meditate. You can use deep breathing to relax and ease pain while you watch TV in the evenings. You can learn to accept your chronic medical conditions without giving up the fight to maximize your capabilities and overcome barriers to good health. In cycling class I sometimes close my eyes and pedal with the music while blocking out the visual cues of numbers and colors on the monitor. The inner focus makes the hard hills easier. Maybe that is a formula for a mindful life where we can gain strength by accepting what is inside us rather than fighting outside stimuli. For the most part fear of the future does not help us deal with the present and for sure none of us thrive with self-criticism. In general I am bad at meditation. I used to be able to lie down in my living room and complete an entire series of breathing and progressive relaxation scripts. My mind and body felt renewed and eerily wonderful afterwards. These days my thoughts wander and I think of this, that, or the other. I don’t seem very interested in reining in my random thoughts and maybe I just don’t need meditation at this point in my life. Or maybe I just don’t practice it enough to get much benefit. But I like to think that I am somewhat mindful and that my life with multiple autoimmune conditions is enhanced when I accept my today with no judgement on yesterday or tomorrow. I strongly believe that when I am comfortable in my own skin, I am a better spouse, friend, parent, neighbor, and citizen of the world. If you would like to read other blogposts from today’s topic on RDBlog Week, click here. Today’s Topic: Tips – How do you stay fit, cope with stress, relax, or capitalize on a great day. Tell us your secrets for the best life possible. When the arthritis gods chose what type of arthritis to add to my life, they picked one that was a good fit for me. That sounds crazy and of course I wish that my list of chronic health conditions did not include any type of arthritis. My systemic arthritis is inflammatory spondyloarthropathy. It is a type of arthritis where for many people pain and stiffness improve with movement as opposed to rest. Before my diagnosis, the most painful thing for me was sitting and I couldn’t drive for more than 20-30 minutes without getting out of the car and stretching. But I could hike 10 miles or walk 18 holes of golf and feel great. My symptoms did not fit with many types of rheumatic conditions because I did not experience fatigue. These days I deal with both spondylitis and osteoarthritis and I am extremely lucky that fatigue is still not part of my daily battle. A good day for me is a day with exercise. My body feels better with movement and for sure my soul does. My biggest challenge is that my feet, hands, and elbows do not allow me to participate in many of my favorite activities. So how do I incorporate exercise in my life? Flexibility in replacing previous activities with activities that work with my body. Tennis and other racquet sports are a distant memory. But I can ride a bicycle and participate in studio cycling classes as long as I wear my lace-up hand/wrist braces. Flexibility in how I participate in sports. I am still reeling from the recent, but probably permanent inability to walk for 9 holes of golf much less 18. But once my left hand fully recovers from surgery, I will be able to play golf using a riding cart. Flexibility in where I exercise. I previously belonged to a Lifetime Fitness Club. Although participants in the fitness classes were encouraged to modify exercises to their abilities, I found that I was modifying everything. I moved to the local YMCA and have thrived with a menu of senior-oriented fitness classes. Flexibility in the level of my activities. I used to do “regular” yoga. Now I do “Forever Well” yoga and occasionally gentle yoga. Both my 12-1/2 year old Labrador retriever and I have difficulty with long walks on pavement, but we can take multiple shorter walks through the day and go to the dog park with wood chip paths. Flexibility in my attitude. I work hard to appreciate what I can do and not mourn over what I can’t. Acceptance improves with practice and my glass half full personality helps with that. Flexibility in my joints, muscles, and tendons. That is kind of a joke because it is the hardest of the flexibilities for me to achieve. But I do my best to keep moving everything. I have to laugh at my rheumatologist who recommends that I push myself but only hard enough that I am not sore afterwards. I’ve never been able to figure that out until I’m sore afterwards…. In general my two kinds of arthritis feud over exercise. Undifferentiated spondylitis says “Go, Go, Go!” and osteoarthritis says “No Way!” But somehow we work it out with the goal of as many good days with exercise as possible. If you’d like to read other posts on today’s RDBlog Week topic, click here. I have a good chance of beating Kerri of Six Until Me in a challenge for the first time ever because she had a baby by C-section two weeks ago. I wouldn’t be so stupid as to place a bet on my results once that “little tomato” “biscuit” “fourth chair” is a month old…. My trick of attaching my Fitbit One to my pump tubing is gaining traction as I recently witnessed Scott Johnson borrow an old-style Fitbit (Zip and One, unlike the more recent bracelet models) so that he could clip it to his pump tubing to track his steps on the basketball court. David E has moved from being an “also-ran” to an unbeatable champion almost every week. I’m not sure that he is more active these days. I think that he is just becoming better at syncing his Fitbit so that his steps count. Just so your know! On Monday Fitbit added a new do-it-yourself challenge called “Adventures.” If you click on “Challenges” from your phone/tablet Fitbit home screen, you’ll see a section called Adventures. This allows you to select a daily or multi-day hike to challenge yourself and receive the rewards of 180º photos at landmarks along the trail. Today I selected the Vernal Falls hike which requires 15,000 steps. (The options that show up in your adventures are based on your average steps.) Although my daily goal is 10,000 steps, my average is closer to 15,000 and that is why all of my adventure options require a lot of steps. As I type this blogpost, I am 331 steps short of my goal and I will walk around the house this evening to make sure I reach my destination. See you out on the Fitbit trail! I went to court last month. Was I nabbed by the diabetes police? Nope. How about the regular police? Not them either. Was I dragged into the legal system for breaking the rules by dosing insulin off my CGM? Nothing like that. So what was I doing? I was getting my ducks in a row. What does that have to do with Social Security and Medicare? The answer to that is a lot. •a copy of your W-2 form(s) and/or self-employment tax return for last year. My advice is to consider this list at least 3 months before signing up for Social Security so that you will have time to obtain any missing documents. Although I had a copy of my birth certificate, I chose to get a certified copy just to be safe. It took about 3 weeks to get the official document from the vital records department of my birth state. “Even if you don’t have all the documents you need, don’t delay signing up for Social Security. You can submit any documents you do have. You can provide the missing documents later or we may be able to help you get them. In many cases, your local Social Security office can contact your state Bureau of Vital Statistics and verify your information online at no cost to you. If we can’t verify your information online, we can still help you get the information you need. So why did I have to go to court? I had to get a court order for an official name change. Since 1976 I have had a discrepancy between the middle name on my driver’s license and the middle name on my Social Security card. When I got married I chose to keep my maiden name as my middle name and abandoned my previous middle name. Or so I thought. I went to Social Security and had a card issued in my new name. When we moved to Minnesota, the DMV required me to use the old middle name on my driver’s license. I don’t remember how my passport was handled, but it has always matched my driver’s license. So my two main forms of ID for the last forty years have not matched my tax information, bank accounts, and everything else that we own. I should have fixed this discrepancy years ago, but it amazingly has never been a problem. Thinking of approaching Social Security and handling our assets in our senior years, I finally determined that it was time to resolve the issue. Changing your name is not difficult. I didn’t need to use an attorney, but did so because a good friend was willing to help me. I filled out a lot of paperwork, seemingly the same thing over and over again. I signed a form allowing for a criminal background check by the FBI. I completed another form for a background check by the MN BCA (Bureau of Criminal Apprehension). More than once I signed that I was not changing my name for fraudulent reasons or to hide assets. On my scheduled court date, I went before a judge with two witnesses and received an official court order for a name change. With the certified copy of my court order, I have applied for a new driver’s license and will apply for a new passport once the DL arrives. It is possible that my name discrepancy might not have been noticed with my Social Security application. However in our increasingly ID-conscious society, it seemed to be an unnecessary risk to be a citizen with two aliases. Two aliases sounds so criminal compared to two middle names…. I don’t know everything about Social Security and Medicare yet, but at least I have my ducks in a row. Most of you won’t have to go to court to get ready for Medicare. However, you may have other things that should be taken care of as you enter this new stage of your life. Now is as good a time as any to get your ducks in a row. My health insurance life is imploding and exploding. I can’t tell the difference between what I know and what I don’t know. What I heard last week isn’t true this week and might change again next week. In January I wrote about dreading Medicare. Today I think it might be the best thing that could happen to me. BCBS of MN is the only company so far to announce its exit from the 2017 individual market. Unfortunately it is the largest insurer in the market and its departure will affect 103,000 of the approximately 300,000 Minnesotans who purchase individual insurance. The recent announcement by BCBS follows a premium hike of over 50% in 2016. This increase was justified by the carrier’s reported loss of $265 million dollars in the 2015 individual market. My 2016 monthly premium was 61% higher than in 2015 and was accompanied by a slightly higher deductible. If BCBS is continuing to experience unsustainable losses with the huge premiums that I am paying, my fear is that no company will be able to survive longterm in this market. Unfortunately as rates soar, many young and/or healthy individuals are choosing or being forced to go without insurance. The downward spiral of an unsustainable market is intensified as the insured population gets older and sicker and costs skyrocket. I have no idea what the landscape for the individual insurance market in Minnesota will look like next year. It seems questionable that the remaining players can absorb the 103,000 people stranded by BCBS. Will other insurers pull out? Will exorbitant premiums, high deductibles, limited networks, and poor coverage be the norm? What will be the effects of the presidential election with one candidate vowing to repeal the ACA? I personally only have to deal with this for three months in 2017 and will transition to Medicare on April 1. I know others who do not have this option. Some of them have Type 1 diabetes and the outlook is bleak. Yes, Medicare is definitely starting to look pretty good. Although 10 months before my 65th birthday seems early to investigate my Medicare options, it’s really not. First, I can sign up for Medicare three months before my 65th birthday and January is seven months away. Secondly, I will be doing most of my research this fall in a period that overlaps with the October 15 – December 7 open enrollment period for all Medicare beneficiaries. That is good because there will be a lot of 2017 plan information available at that time. That is bad because most insurance brokers and company representatives will be busy and it might be hard to get individual attention. Thirdly, as someone with a pre-existing health condition, my initial selections can have lifelong effects. If I do not choose a Medigap (Supplemental) policy during my one-time Medigap Open Enrollment Period (the first six months after I turn 65), I can be refused Medigap coverage or charged higher rates in the future. Although an Advantage plan may seem more favorable in the short run, I need to analyze that decision on a longterm basis knowing the problems of switching to a Medigap policy in the future. Minnesota has the highest concentration of seniors with Medicare Cost plans. These plans are a hybrid between Advantage and Supplemental policies and may end up being a good choice for me. Federal government: Websites such as Medicare.gov and Cms.gov are the most reliable source for current Medicare information and regulations. SHIPs: State Health Insurance Assistance Programs (SHIPs) provide free one-on-one insurance assistance to Medicare beneficiaries and links to resources for senior citizens in each state. They are state-specific grant-funded projects of the U.S. Department of Health and Human Services. Select your state on this site to obtain the relevant phone number and website. In Minnesota I am linked to the Minnesota Board on Aging along with the Senior LinkAge Line® and MinnesotaHelp.info®. Insurance Companies: Commercial insurance websites currently provide information about 2016 plans. The 2017 plans will be released in October. Help numbers and retail store appointments are some of the options offered. Most companies also sponsor group sessions which provide information on Original Medicare, plan choices, and differences among the plans. Last year I attended an insurance company-sponsored meeting titled “Medicare 101.” This year I will attend one or more sessions provided by the companies whose plans I am considering. Miscellaneous Websites: I can Google specific topics and receive multiple website recommendations. It’s a good idea to evaluate the reliability of the data and the source of the info (government vs commercial vs good information vs snake oil). Books and Publications: Most of the websites mentioned above have free pamphlets and downloadable books. I have already downloaded the 160-page “official U.S. government Medicare handbook” titled Medicare & You 2016 from the Medicare.gov publications link. You can also purchase commercial books such as Medicare for Dummies. Insurance Brokers: Insurance brokers who specialize in Medicare are a good source for individual help. They earn commissions from the insurance companies and are free for users. In recent years I have worked with an excellent broker for private insurance and recently touched base with the Medicare specialist in the same firm. 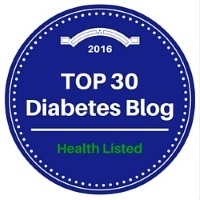 Friends with diabetes: I have already gained useful information from some of my Type 1 friends already on Medicare. For learning the ropes of navigating Medicare with an insulin pump and a CGM, they are a practical and valuable resource. In some ways learning about Medicare is not that different from learning about diabetes. A lot of it seems confusing and overwhelming at first. As you learn more, you begin to understand how things fits together and become more confident about your decision-making skills. At the moment I would argue that my diabetes expertise greatly outweighs my Medicare knowledge, but I think I’m on the right road. If you have other sources of information about Medicare, please share them in the comments. Advice is always welcomed! Happy Birthday, Abby the Black Lab! Abby the Black Lab, who is wise about all things related to diabetes, is celebrating a birthday. Her blogposts are some of the most-read posts at Test Guess and Go. Someday I hope to have half as much wisdom as she does. Please wish her a Happy #10! Some of you may have received an email from me yesterday asking you to sign into Google Docs and check out some I shared with you. I learned about the problem yesterday morning when I was 30 minutes from home and heading to Target before a D-friend meet-up lunch at Costco. My friend Susan from Scottsdale is convinced that there is a proper way to bolus for one slice of Costco pizza, but I have never figured it out. I keep meeting her over and over again to give it another try, but my blood sugars always suffer. In the Target parking lot, I changed my Gmail password knowing that there wasn’t much more that I could do at that moment and headed into the store, somewhat in a daze. Fortunately my shopping list was only 6 items and I quickly threw them in the cart. I met my friends at Costco and slurped up several Diet Pepsi’s because my stomach was too stressed for pizza. I still haven’t forgiven Costco for switching to Pepsi from Coke, but that’s an issue for another day. I am usually an expert at deleting posts from Nigerian princes asking for my money and passwords and I have never been hacked before. Unfortunately with 20-20 hindsight I now know that the post that resulted in my email breach was the result of a hack of a DOC friend who had once legitimately shared a document with me on Google Docs. I can see in my Gmail device history that the breach was instigated by a Windows computer in Malaysia. Hopefully new passwords and two-step device verification will prevent another intrusion. Recently I was accused of being a digital hoarder because I have almost 10,000 emails that haven’t been categorized or deleted. Guilty as charged and yes, I have been sufficiently punished. If you received a hack email from me, I apologize. If you receive a suspicious email from a DOC friend or anyone else, check it out before innocently clicking on links as I did. If you have a magic bolus formula for Costco pizza, let me know. And if you can convince Costco to abandon its Pepsi contract and go back to Diet Coke, I’d appreciate it.